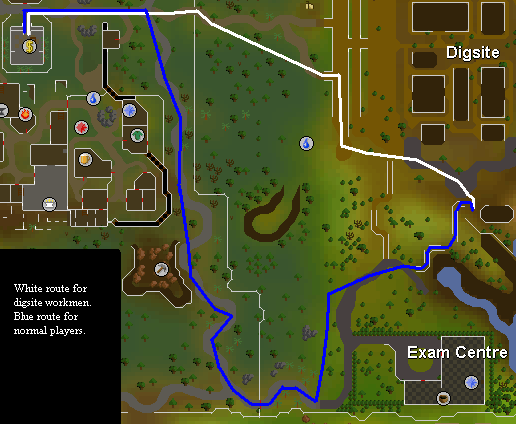 Note: This guide is for the Oldschool version of Runescape. 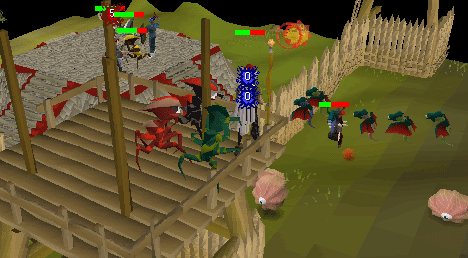 To see the updated, Runescape 3 guide for Pest Control click here. If you are Maging then it is suggested that you use a high level spell. The sort of spells that are commonly used are Ancient Magick, God Spells and the high level Surge or Wave Spells that require Blood Runes. The reason it is suggested that high level spells are used is that none of the monsters in the game are particularly low leveled and since the game is rather fast you want to be able to cast damage quickly rather than slowly. Be warned though that this method can be rather expensive. You may also wish to bring a hammer and hatchet in order to chop trees and repair defences. Head to the south of the island where you will find a pier. 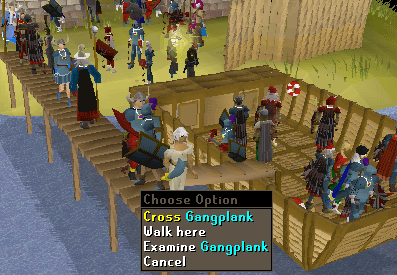 Walk along it until you get to a Gangplank. Cross it and you will get a message in your chatbox, and will be inside the craft that will take you the last distance to the game. 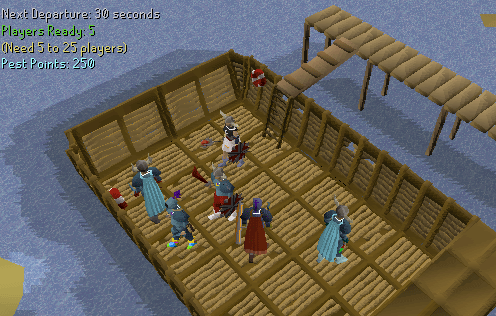 If you clicked to enter the boat by accident then you can climb up the ladder on the west side to get out. To make sure you don't go out by accident too there will be a message that comes up and you will be asked if you are sure. It is suggested that you play on a world with 1600+ people on it so you aren't waiting around a long time between games. World 78 is the world that most people play on, so if you want games without a wait between, go there. Once there are 25 people in the craft or you have been waiting 5 minutes and there are at least 5 people in the lander you will be off to another island to play the game. Sometimes lots of people will enter at the same time and you will miss a game. Don't worry, you have priority and should get to go to the next game. The higher your priority level, the higher the chance of getting into the next game. Once the lander arrives on the north side of the island you will get a message telling you the object of the game. There are two ways that you can win the game. This may sound easy, but it isn't since there are monsters ranging from level 21 to 157 trying to stop you in your task and kill the Void Knight. The more people there are playing the game, the more monsters there will be. This means that it is possible to win whether there are 5 players or 25 players. If you die you will just appear back in the lander where you appeared when you arrived on the island. When on the boat to get to the island, or playing the game itself, there will be extra information telling you about the game. When you are on the boat there will be information in the top-left corner of the screen. The top line tells you how long it will be until the next game starts if 25 people don't turn up. The second line tells you how many players there are in the lander (this can be more than 25 if people board the boat quick enough because games won't start less than 2 seconds apart). The third line tells you that you need between 5 and 25 players for the game to start. The bottom line tells you how many Pest Points you have. 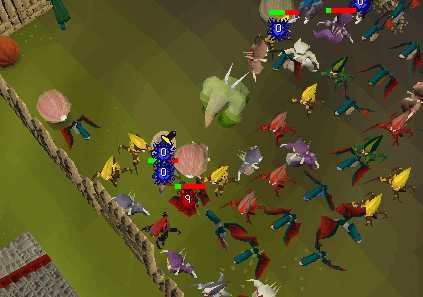 Pest Points can be exchanged for rewards, and the more you have, the more rewards you can get. Note: If you enter the boat while you have 250 Pest Points, you will be warned that you won't gain any more (since 250 is the maximum amount of points you can have at one time). The interface when you enter the game gets slightly more complicated. One the left side of the screen the top symbol says how many Life Points the Void Knight has left (he starts with 2,000). The middle symbol tells you how much damage you have hit, and the bottom piece of text says how much time is remaining if the Void Knight doesn't die. One the right side of the screen it tells you how many Life Points each of the portals has left. The one on the left is the west portal, the next one is the east portal, the next is the south-east portal, and the one on the right is the south-west portal. If you want to be able to make the most out of this game you will need to know what to do. There are 2 main things that you may be doing. These are Attacking and Defending. Once again this isn't quite as easy as it seems and you will need to have good tactics to be able to win every time make those trying to make you lose obsolete. The role of the Attackers is to destroy the 4 Portals situated around the island. These are situated through the gates that exist to stop monsters getting through and able to cast damage on the Void Knight. Once the lander arrives you will most likely head towards either the east or the west gate. The first person to get to the gate should open it and wait until everybody else who is running towards that gate has gone through then shut it to stop and monsters getting through. When running through the gate you will notice that ahead of you are the portals that it is your job to destroy. With around 5 or 6 people attempting to kill the portal together it should go down fairly quickly, but if there are any Spinners around then they need to be killed before trying to take down the portal. This is because they heal the portals and do it with reasonable speed. Once the portal has been destroyed no more monsters will be able to enter the game through it and you can walk across it. The Void Knight will also heal 600 Life Points when a portal gets destroyed. Now that you have destroyed your first portal you will most likely have to move on and kill another. These can be found on the south side of the island. Since it will now be further into the game, there will be more monsters around it and because you can't walk through some of them you may have to kill something before being able to get to the portal. If you took a long time over killing your first portal, the people who went to the other side first may have already killed the portals on their side and come and help. This makes the portal easier to kill, but there will also be more monsters around making it even harder to stay alive. While around half of the team is Attacking the portals, the other half of the team will be Defending the Void Knight. He can be found just south of the landing craft on a raised platform that looks a bit like a pyramid with the top cut off. If you keep him alive until all the portals have been destroyed or the 20 minutes are up you will win the game so it is important you know how to defend well. The towers can be found either side of the three gates. If you are Meleeing then there isn't really much point of being up here because all that you may be able to kill is the odd Shifter that teleports up. If you are a Mage or Ranger then this is a great place to be. You can get great views from up the towers which means that you can hit monsters that are annoying Meleers down on the ground below. The only problem is that the Defilers and Torchers can Range and Mage you from down on the ground. This is where many people will defend from. There are several jobs that you may have to complete if you chose the station yourself here. Because you cannot walk through Shifters this job may get slightly frustrating having to step around each monster individually, but as a team it shouldn't be too hard to kill everything that appears. Sometimes a gate may be left open by a forgetful or deliberately annoying member of your team. If you see this then you should shut the gate as quickly as possible and check if any monsters escaped through it. If something did get through then you should try to kill it/them as quickly as possible. If 1 person tries to kill the front monster in the line and another distracts any behind it in the queue, then starts killing them from the front backwards, making sure that as one dies, somebody is attacking the one behind they should die without dealing too much damage to the Void Knight. If the Void Knight gets low on health then people may stop and let there be no chance of winning, but if you carry on right until the end you will get the most experience possible and maybe give enough time for the final portal to be destroyed. If a Ravager happens to destroy a gate then you're in a small bit of trouble. All monsters will be able to make their way through this gate and cause damage on the Void Knight if it isn't repaired. To repair it you must chop down a couple of the trees located around the island, right-click on the damaged gate and select "Repair". To do this you will need a Hammer. You will only be able to repair 1 gate at a time, but once one is fixed you can just stand in the way of the monsters trying to get through and kill them one by one. Defending beyond the walls can be great combat experience, but there is also a higher chance of dying. You can also get trapped in by having monsters that you cannot walk through on all sides of you. The best place to go to defend beyond the wall is through the south gate. At the start of the game from the boat there are 3 trees just to the south of you. If you manage to run past the east of the middle tree you will get the the gate easily, but if you run past the the west you will get stuck to the north of the Void Knight and have to maneuver around it. Once through the south gate there will be a lot to kill. If you have completed the Desert Treasure Quest and have got Ancient Magicks then this is a great place to use the multi-target spells due to the high density of monsters. Meleeing is just as useful here because you can always be killing something. If you are low on health then using the Protection Prayer that the most monsters are hitting you with will increase the amount of time you will survive for and make the time you spent there more worthwhile having killed more monsters. This is one of the fastest ways to gain combat experience, especially in melee stats. 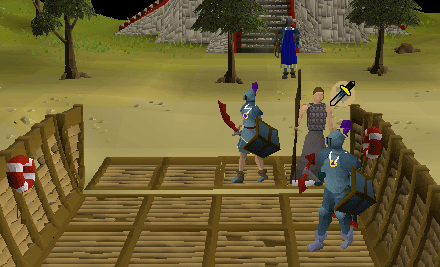 For this method of combat training you need a full set of Dharok's armor (Dharok's platebody, platelegs, helmet and greataxe), 70 attack, 70 strength, 70 Defence and have at least done the explosive potion in Digsite Quest. Full Dharok's, amulet of fury, warrior ring, rune boots, Recipe for disaster gloves, Legends/obsidian/achievement/fire cape. This is just an example of effective equipment. You can replace these items with the best you can afford. Next we will start taking advantage out of Dharok's special ability (lower Life Points results in higher hits) by dropping the Unidentified liquids. When you drop one, you will get hit by 250 damage. Drop many as you can, without dying of course. For example: you have 760 Life Points, drop three potions. 3*250=750, so you will have ten Life Points remaining. 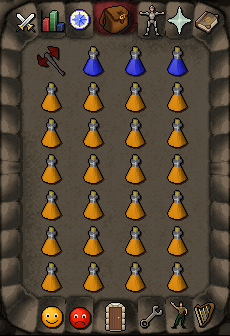 Make sure you drop these in the Pest control arena, because if you accidentally drop too many potions, you will die and lose your items. Also, remember to perform the Dragon Battle axe special or drink a dose of a super strength potion, along with drinking a dose of a super attack potion. 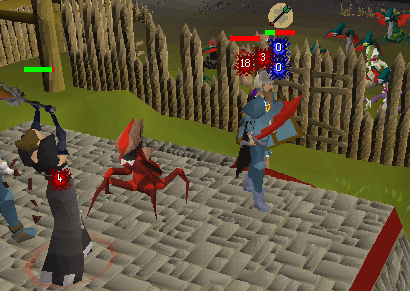 Now, you will have low Life Points, a high strength, and a high attack level, ready to play in a Pest Control game with full Dharok's armor. Note: you can use the rock cake from the Recipe for Disaster Quest (hits 40 when you try to eat it), but if you have completed the Dwarf part, you can't get it anymore. 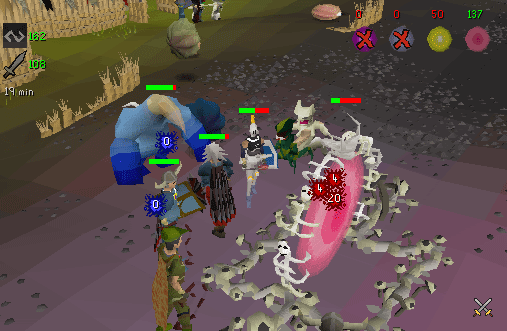 It is recommended that you attack the portals while using strength and attack prayers. In addition, try to stay behind or on the sides of the portals to prevent the monsters from attacking you easily. DO NOT try to kill the spinners. There are many monsters surrounding the spinners that can easily one-hit you, causing you to die because of your low Life Points. If it happens that some of the monsters get to you, take off your boost prayers and switch to a protection prayer and the kill the monster that is attacking you. Then, take your protection prayer off, turn on the boost prayers, and attack the portal again. The most dangerous part in this method is when you move from portal to portal because then there are multiple monsters that can attack you. This method is better for experience, since you're going to be killing many low-leveled Defence monsters. 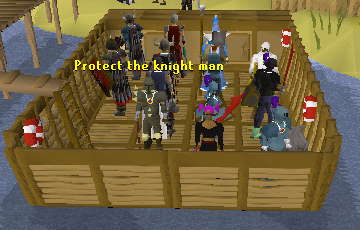 Get to the Void Knight and attack the shifters that are attacking the knight. The shifters will be focusing on the knight, so they will not attack you. Of course, you can kill the lower level shifters without praying. This might be more fun that attacking the portals, since you will hit high often, but other players might need your help at the portals. Must have completed the Desert Treasure Quest. Rings of dueling/amulets of glory. Trowel (if you haven't left the barrels open). If the barrels are not open use the trowel to open the barrels. 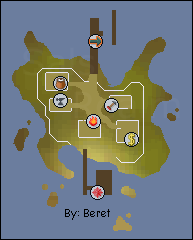 Cast Senntisten teleport, follow this map to the barrels, and use vials with the barrel with orange liquid in it. 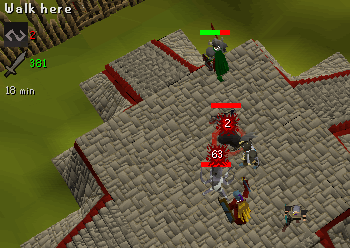 After that, use a Ring of Duelling or Amulet of Glory to teleport to Castle Wars or Edgeville and bank the potions. Then, take out new empty vials and teleport back to Senntisten. Repeat this until you have enough potions to satisfy your needs. Note: An amulet of glory might save money, but you'll need to have many amulets or charge them often. Note: This method is much slower than method 1. Air/fire staff, air/fire runes and law runes. Fill the vials and repeat until you have enough explosives for your needs. 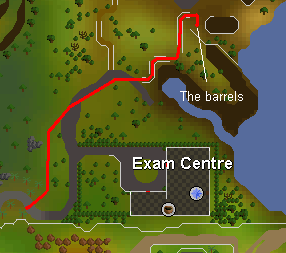 Note: if you don't have level 25 magic you can always walk/run from Varrock to the barrels and from barrels to Varrock. This is not suggested, because this will make it even slower. 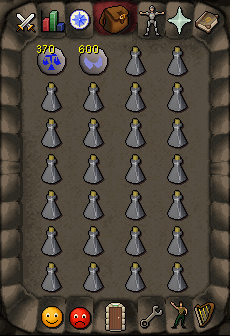 You can also teleport to bit north of Digsite with the Digsite pendant from the Varrock museum mini-quest. You can also take the Explosive potions to the Archaeological Expert in the exam center, who will make them into Nitroglycerin. Nitroglycerin hits 300 when dropped. There are many things that give you the advantage over the monsters if you know how to use them properly. 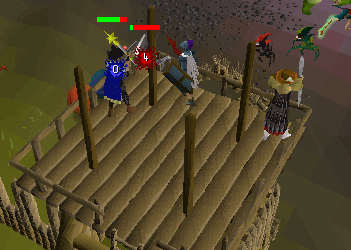 The Barricades are the first Defence to stop the void Knight getting hurt. They will stop any monsters other than Ravagers or Splatters when they explode. The Barricades may be only partly destroyed or if you were really unlucky there will be nothing left of it at all. They can be repaired in the same way as was described to repair gates earlier in the guide, but it isn't really worth wasting logs to repair them other than a last resort. If you repair a barricade it counts as 50 Life Points towards the 500 Life Points you need to hit to be able to get a reward if you win. Gates are a great Defence. They can stop large numbers of monsters wandering up to the Void Knight and casting damage on it all at the same time. As long as they are shut they are of use and can only be destroyed by Ravagers. It was explained earlier how to repair them. Trees are used to repair the Gates and Barricades There are only a limited number on the island and they re-appear slowly so don't waste them or chop them all down by yourself and leave none for other people to use. This is supposed to be a team game after all. Because the Void Knight is on a hill, when you are standing on the top you get a larger view of the surrounding area then when you are on normal ground. When defending being on this hill is an advantage because you can see when Gates have been left open and monsters have managed to get though. Next to the Landing Craft is a Squire that you can talk to. He will tell you how to repair things and other important things about the game if you happen to have forgotten them. He will also take you back if you wish to leave. Well, you know about the island and how to win the game, but you don't know about the monsters. There are 7 different types of monster, and each monster comes in 5 different levels. Each level has a slightly different color so if you can learn the colors, you can also learn how difficult the monster is. Here is a description of each of the monsters. These take up one square and you cannot walk through them. They use a Range attack that can hit high constantly. They are a real threat and can make you lose the game if you don't kill them quickly. They could be anywhere around the island so if you see one and aren't attacking a portal it's worth killing it. These are third priority to kill. These take up more than one square and you can walk through them. They use a Melee attack and can destroy Barricades and Gates. They don't hit very high, but due to what they can do these are the top priority to kill. If you see one, make sure it's dead before it reaches a gate. These take up one square and you cannot walk through them. They use a Melee attack and can teleport around the island, so if one is attacking you you cannot run away. They can teleport up into the towers and across walls. These can be found mainly in the area around the Void Knight, trying to attack it. They are fairly easy to kill and don't hit very often. These are a low priority to kill. These take up one square and you can walk through them. They use a Melee attack and will heal the portals if you don't distract or kill them. They have a very low attack level so they miss a lot. Because they can heal the portals they are second priority to be killed after the Ravagers. These take up one square and when they die will deal large amounts of damage to surrounding monsters and people. Because of this they are only worth killing if they are in the middle of lots of monsters and it will hit damage to all of them. You can walk through them and they cast a shadow on the ground. They can explode and damage Barricades so the best idea is just to leave them and let them do what they want. They don't help you, but aren't a large hindrance either. These take up one square and you cannot walk through them. They use a Magic attack which can cover large distances so can be a pain. They hit fairly often with reasonable power, so they are fourth priority to kill. As with most things, if you win you will get a reward, if you do it faster you get a better reward and if you fail you get nothing. If you lose (the Void Knight dies) then you will appear beside the landing craft and get this message in your chat screen. You will get no prize and just have more determination to go in again and win. If you win then you will be rewarded for it. 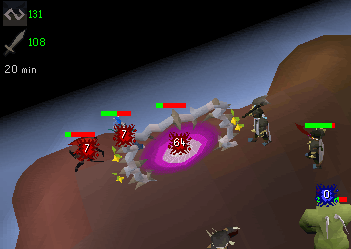 You will be given a Void Knight Commendation Point and if you won by destroying all the portals you will also get money calculated to the formula "Combat Level*10". 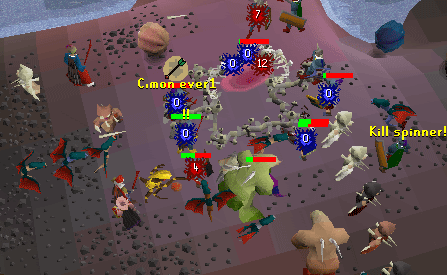 This means that for each combat level you are, you get 10gp. Note: If you didn't hit at least 500 damage on monsters or portals during the game you will not receive a reward even if your team won. You may be thinking what use these points are, but in fact they can be of great help to you. You can exchange them for combat experience by talking to, or selecting the option to "Exchange" on any of the Void Knights wandering around the Outpost. When you chose to you will get a screen that looks like this. When you exchange a point for experience you will be told how many points you have left and what you just trained up. 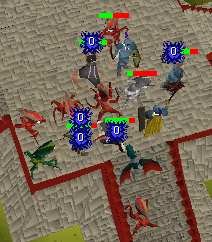 One of the main reasons people play Pest Control is for the great combat experience you can gain. If when you divide by 6 or 12 there is a decimal left over, the amount of experience you gain won't follow the rules of mathematics and will round down whatever the decimal. 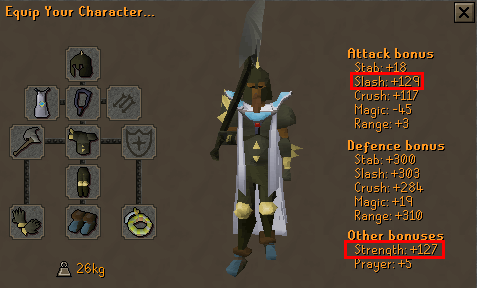 This item has no equipment stats to display. 25 noted Coal and 18 noted Iron. 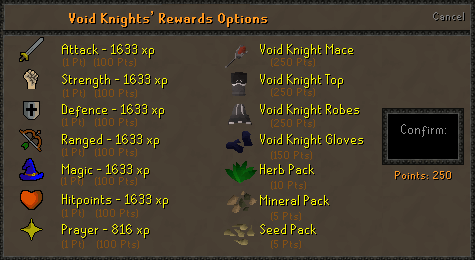 4 higher level seeds eg. Limpwurt or Watermelon. 11 lower level seeds eg. Onion. If you manage to obtain 250 points, then when you try to enter the landing craft you will be asked if you are sure that you want to go on. This is because you can have a maximum of 250 points at a time, so you will have to exchange some points for experience or you will be missing out on the rewards.